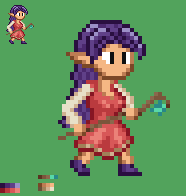 I've been working on some pixel art for a character, roughly following some 16-bit guidelines. I feel like increasing the resolution to 40 pixels high helped out a lot compared to my earlier version, but I feel like this is still not up to par. I appreciate any feedback. Be critical. Rip my work to shreds, draw red lines over everything, make me cry and question my life choices. It needs some tweaking to get the palette under 16 colors with the transparency; for this rough sketch I just used 4 shades for each base color. I'm assuming the staff would be drawn as a separate sprite so it could be swapped out for an upgrade. It's really just a sketch at this point though; I'm not ready to try to fit this into any system requirements just yet. I'm more concerned with "why doesn't the hair look right" and "Why does the body look wrong" before I get into the stuff. Last edited by Marscaleb on Thu Jun 07, 2018 12:13 pm, edited 1 time in total. Looks cool. 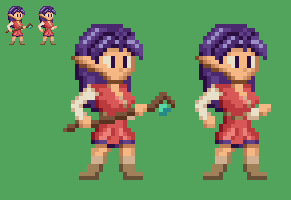 16-bit pixel art is not my specialty, but there's a noticeable lack of volume in the face, compared to the rest of the sprite. The hair and the dress have very complex shading, so the face clashes badly with them. The proportions between the arms and the legs are a bit weird too, the legs are way too stubby compared to such long arms. I've tried redrawing the sprite using some earlier sketches as a reference. Not really sure if I like this version better. I think this is a big improvement! Her posture is better, proportions are better, and even her staff is more discernible.